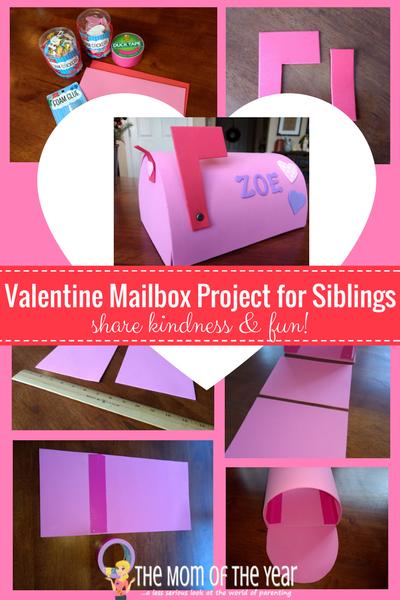 Welcome to the “End Sibling Squabbling Valentine Mailbox Project”! This is a project with a purpose. 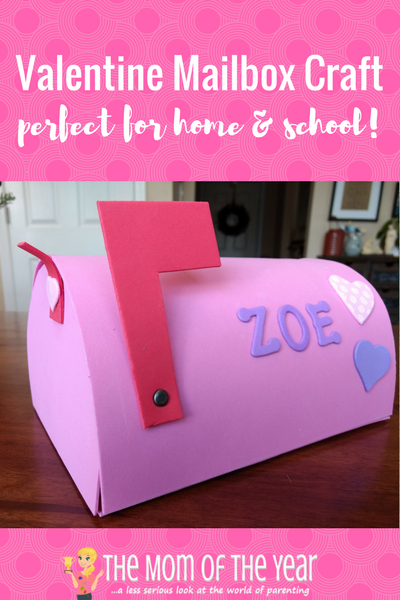 After your kids make these Valentine mailboxes, have them and write and deliver nice notes to each other for at least a week leading up to Valentine’s Day. 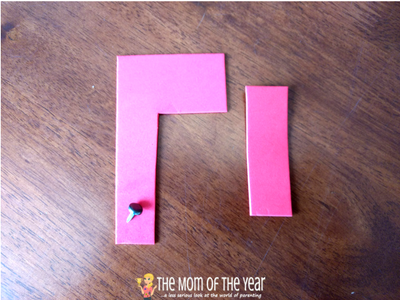 This seemingly simple activity is genius! It solves a lot of problems at my house, which makes this winter season more pleasant for everyone. Most importantly, it improves sibling relationships. During a time of year when being cooped up inside due to colder temps, coupled with post-holiday letdown, can lead to siblings constantly getting on each other’s nerves. While the bickering and fighting can lead to hurt feelings, writing down something positive about their brother or sister each day helps to remind them of all the things they love about them instead of just focusing on the negatives. This project offers a chance to be creative. 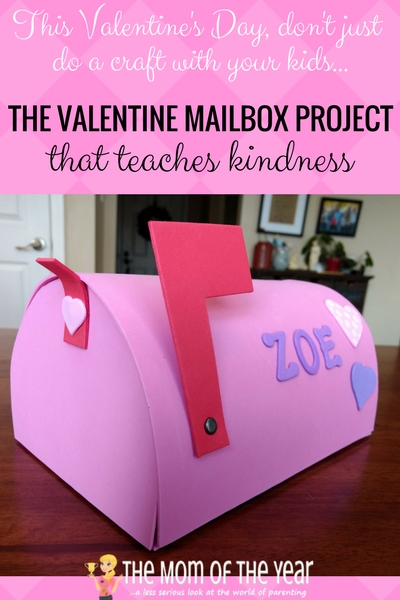 When I was in grade school I loved delivering and getting Valentines but my favorite part was making the mailbox in anticipation of all the cards and treats I would get. Ah, those were the good ole days! 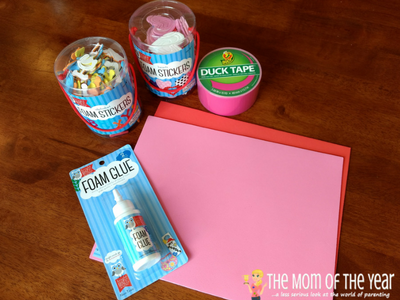 Though Valentine’s Day is now less of a big deal at my kids’ school, I love the chance to share this craft with them at home while reminiscing about my school days. I also love that this project gets my kids happily away from screens for an afternoon so they can use their brains to make something creative. It’s something to look forward to during the winter. Let’s face it, other than Valentine’s Day, after the big holidays are over and the elf has flown back to the north pole, it is still awhile before the weather is warm enough to start playing outside. 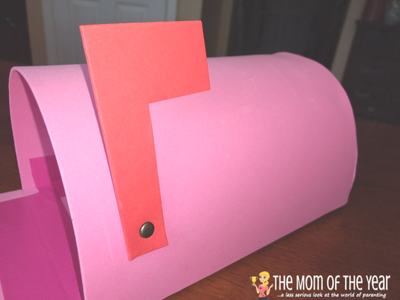 This Valentine mailbox activity is something fun to throw in those cold days. Siblings will be challenged coming up with new things they love about their brothers and sisters while they eagerly anticipate the day they can open their mailbox and read their notes. Write one nice thing about each of your siblings each day and deliver to their mailboxes. Write something new each day! No repeats! No peeking! Wait until Valentine’s Day to read all your notes. Parents can participate too if they want. 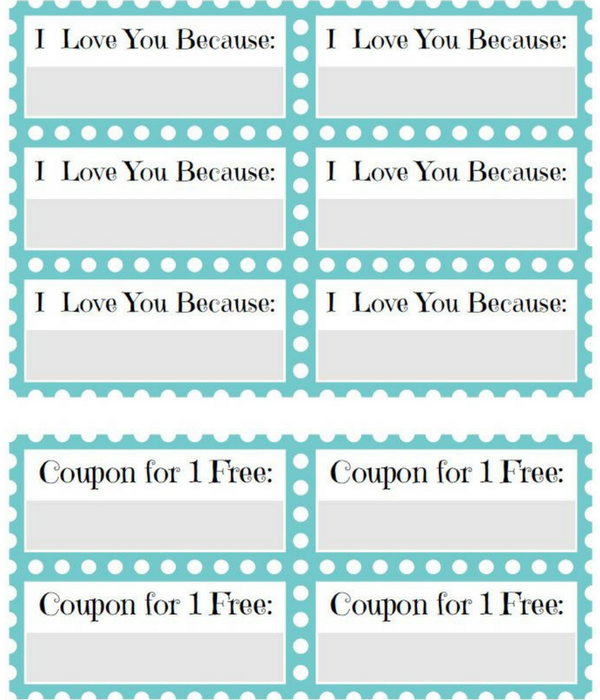 Slips of paper for the notes–grab this free printable HERE for pre-printed notes and some fun bonus coupons for the holiday! 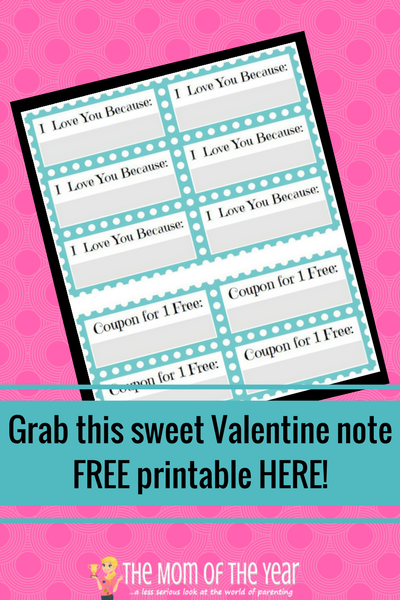 Download this free printable HERE! 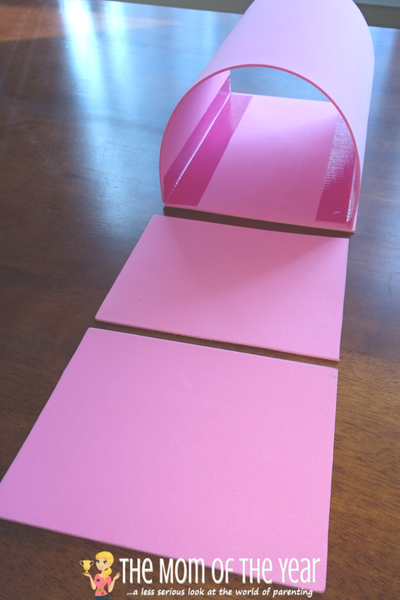 Cut one foam sheet in half so you have 2 pieces that are 6” x 9”. One of these sheets is now the base of your mailbox. 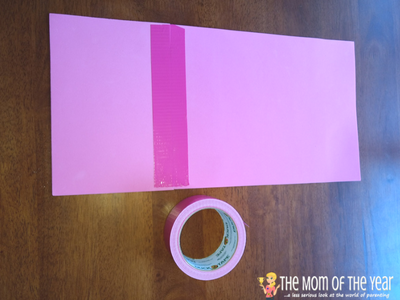 Line the second, un-cut foam sheet up with the half sheet and attach with duct tape. 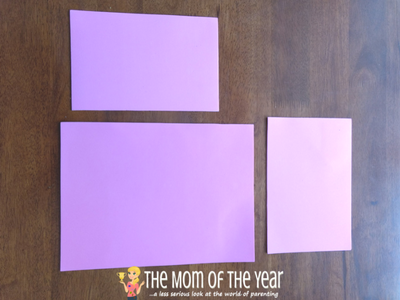 Roll this sheet up and attach to other side, making sure to tape on the inside. Take the last piece and cut it in half to make the ends of the mailbox. You should have two pieces 4.5” x 6”. 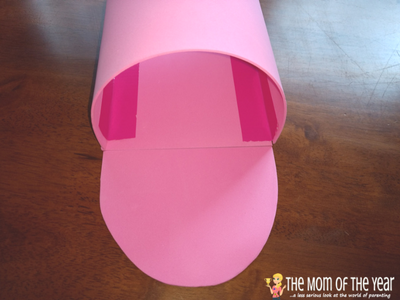 Trace the opening of each end of the mailbox and cut out. Tape the back end of the mailbox entirely with tape. 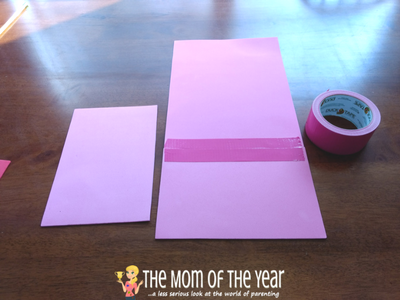 For the front of the mailbox, only tape the bottom, so that you can open and close the flap. 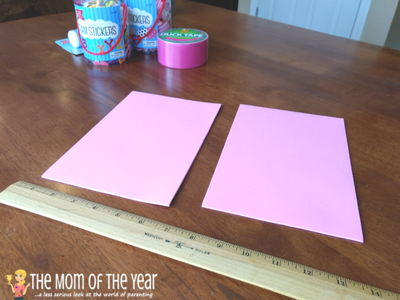 Use the red foam to cut out a mailbox flag shape and a smaller rectangle that will be used as the handle for the front flap. Glue the handle onto the front flap. I also secured this with a brad to make it extra secure. Then, decorate your mailbox with foam stickers, markers, glitter, or whatever you have handy. 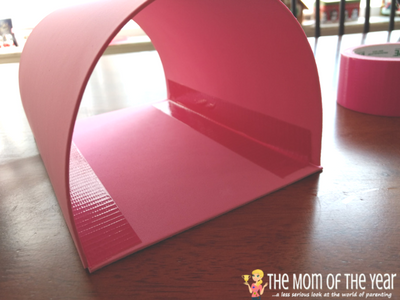 I hope you and your kiddos enjoy making this Valentine Mailbox Craft and that it’s a fun family activity to help your kids get along a little better this winter! I’d love to see pictures of your mailbox or notes that your kids wrote to each other. So glad you like it Janine! Hope it helps with the sibling squabbles! I definitely could use this for my kiddos!! Great idea. Hi Bri! Hope your kids love it!